Columbus grass is a natural hybrid between Sorghum halepense (L.) Pers. (Johnson grass) and Sorghum bicolor (L.) Moench (grain sorghum) (USDA, 2010; Hacker, 1992). Columbus grass (Sorghum x almum Parodi) is a robust, tussocky, short-lived perennial. It has numerous tillers and thick short rhizomes. Culms are thick and solid and can reach up to 4.5 m. The leaves are 2.5-4.0 cm wide and waxy. 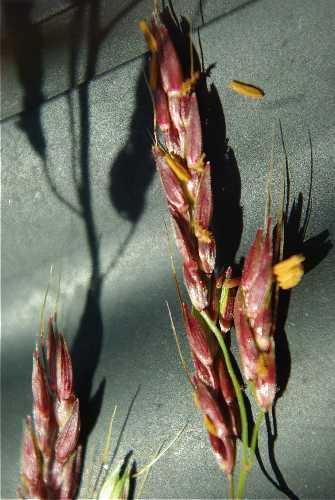 The inflorescence is a large pyramidal panicle with secondary and tertiary branches, generally drooping as seed ripens (Cook et al., 2005). Columbus grass is one of the most valuable summer forage and fodder crops in semi-arid and sub-humid areas (FAO, 2010). Columbus grass is thought to have originated in Argentina. It is now found worldwide within 25°N and 30°S and from sea level to an altitude of 700 m.
Optimal growing conditions are an annual rainfall ranging from 460 to 760 mm, average day-temperatures between 15°C and 22°C, on fertile, well-drained loamy soils or heavy clays, with soil pH ranging from 5 to 8.5. Columbus grass may withstand drought periods but has no tolerance of waterlogging or flooding (FAO, 2010; Cook et al., 2005). Its growth is impaired below 15°C but it can survive mild frosts if the stand is well established (Cook et al., 2005). Columbus grass is also one of the most salt-tolerant grasses, comparable to Chloris gayana, Panicum coloratum, Pennisetum clandestinum and Digitaria eriantha (FAO, 2010). 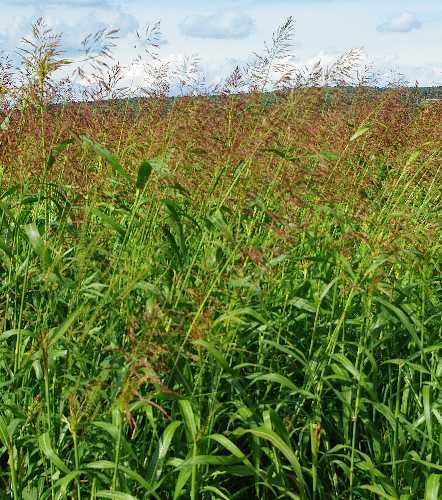 Columbus grass (Sorghum x almum) provides valuable fresh forage used as pasture or in cut-and-carry systems. It should be cut down to 5 cm every 6 to 12 weeks (Ecocrop, 2010). It makes a good quality, though coarse, hay and silage, provided it is cut at the mature stage and the weather is not too wet (Cook et al., 2005). Columbus grass is a fast-growing and high-yielding species that will weaken within 3 years. In Australia, it is usually grown in pure stands but also thrives when mixed with other grasses such as Megathyrsus maximus, Cenchrus ciliaris or Chloris gayana. Such pastures first benefit from the fast-growing Columbus grass and later from the other perennial species (Cook et al., 2005). Columbus grass responds well to additional N, P and K fertilizers and generally yields 4-12 t DM/ha, sometimes up to 20 t DM/ha (Ecocrop, 2010; Cook et al., 2005). Seeds yield 0.3-1.6 t/ha (Cook et al., 2005). Columbus grass is used as a pioneer grass in Queensland (Australia), where it thrives among the ashes of the legume-tree Acacia harpophylla (Cook et al., 2005). 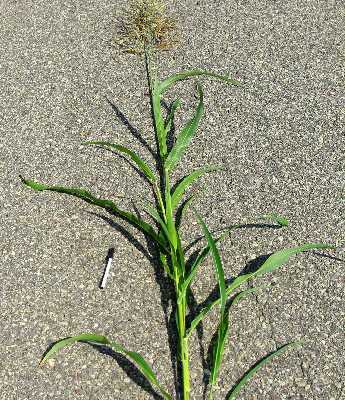 Though less rhizomatous than Sorghum halepense and thus easier to remove, Columbus grass is considered as a noxious weed in several states of the USA and Australia (USDA, 2010; Cook et al., 2005). In Australia, sales of Sorghum x almum seeds have been restricted for fear of reversion to its rhizomatous parent Sorghum halepense (Cook et al., 2005). Like other sorghums, fresh Columbus grass contains dhurrin, a cyanogenic glycoside that releases hydrogen cyanide (HCN) after hydrolysis (FAO, 2010; Cook et al., 2005). In sorghums, young shoots and leaf blades normally contain higher HCN levels than leaf sheaths or stems. Inflorescences are low in HCN and seeds contain none. Upper leaves and tillers (which are mainly young leaves) contain more HCN than older leaves. The amount of dhurrin depends on plant age (higher when young), growing conditions such as fertilizer levels (high N amounts or unbalanced NPK ratios increase dhurrin content), frost exposition and water stress (Rhykerd et al., 2009). Columbus grass may be hazardous in pure stands due to its high HCN content. As with other young sorghum crops, it is recommended to use a tester animal to graze the crop first for 20 minutes; if no toxic effect appears, the whole herd can enter the crop. Hungry animals should be kept out of the sward or should be given cereal grain before entering the sward as carbohydrates inhibit the hydrolysis of dhurrin (Rhykerd et al., 2009). Herds should be progressively accustomed to Columbus grass, for instance allowing 30 minutes of grazing the first day, one hour the second day, three hours the third day, etc. (FAO, 2010). High stocking rates (for example 10-15 head/ha for cattle) and rotational grazing is another way to prevent HCN poisoning as these methods limit intake (Rhykerd et al., 2009). Supplementing grazing cattle with sulphur blocks can also reduce HCN poisoning (Cook et al., 2005). Columbus grass may contain potentially toxic amounts of nitrite, though no cases of poisoning have been reported (Cook et al., 2005). The nutritive value of Columbus grass is dependent on the age of regrowth and it provides good feed only on soils which are at least moderately fertile (Hacker, 1992; Cook et al., 2005). Between 6 and 14 weeks, crude protein decreased from 15.6 to 5.2% DM, NDF increased from 52 to 69% DM. Dry matter and nitrogen degradability decreased from 41 to 32% and 48 to 33% respectively (Lanyasunya et al., 2007b). The application of fertilizer improved the in vitro gas production, suggesting enhanced fermentation (Lanyasunya et al., 2007a). It stands heavy stocking and will give several grazings in a season (up to 2-3 grazings per season for a rain-fed crop), but it does not stand heavy trampling and is therefore more suitable for rotational grazing. It should be grazed heavily once the crop is 50 cm high to prevent it from growing too coarse. For maximum regrowth, stubble is left at 15 cm (FAO, 2010). Silages harvested between 7 and 13 weeks post-planting compacted well and the fermentation was complete at 21 days. Soft dough stage (80 days post-planting) was found to be the optimal stage for ensiling, being a good compromise between yield and quality. However, it did not meet ruminant requirements for protein (14.7 to 6.4% DM) and P (0.21-0.12% DM), though other minerals were sufficient (Kallah et al., 1997). The following table summarizes research findings of grazing Columbus grass on performances in cattle. For regrowth of 56, 70 and 84 days Columbus grass intake did not exceed 1% of the total body weight in goats. Due to the low dry matter intake, crude protein intake was also low and goats did not meet their maintenance requirements (Elizondo, 2004). Goats fed Columbus grass produced 0.73 kg of milk per day (Herrera et al., 2009).